Publication of my works from end of September in more than 51 countries and in the i-tunes store from Apple, Kobo, Barnes&Noble and all other e book providers. The work “Zara” from Beautiful people series has been selected by Salvatore Russo for bebopart ® EA editore 2013 (www.bebopart.com/eaeditore). Beautiful Art guide which contains Holland's most famous and remarkable musea, available in the better bookstores throughout the Netherlands. There is a double page including my works, you will find it at page 90 (www.fransastic.com). New York art book by Basak Malone publishing picture "Reyam". 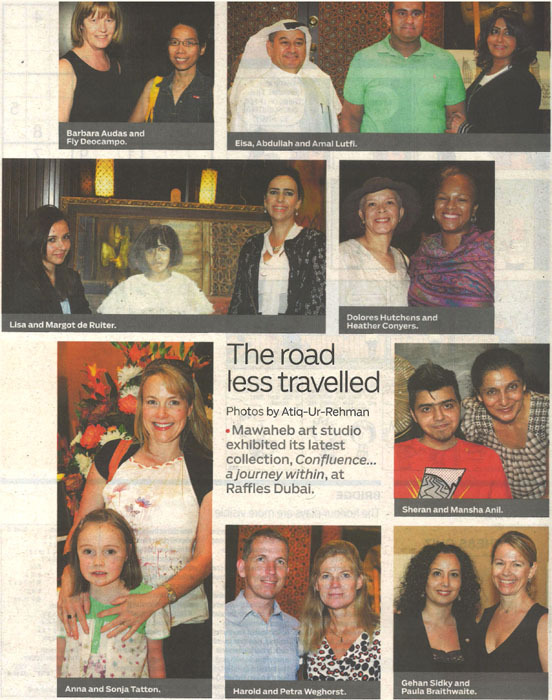 The Gulf News picture the tabloid pages Margot and Lisa at the presentation of Mawaheb exhibition in Dubai Raffles/Wafi with painting beautiful people "Reyam". Beautiful Art guide which contains Holland's most famous and remarkable musea, available in the better bookstores throughout the Netherlands. There is one page including my works, you will find it at page 54 (www.fransastic.com). Beautiful Art guide which contains Holland's most famous and remarkable musea, available in the better bookstores throughout the Netherlands. There are 2 pages including my works, you will find them at page 166/167 (www.fransastic.com). Beautiful Art guide which contains Holland's most famous and remarkable musea, available in the better bookstores throughout the Netherlands. There are 2 pages including my works, you will find them at page 132/133 (www.fransastic.com). Takes you on a visual journey celebrating outstanding artists from all over the world. This first book in the two edition series, by Kennedy Publishing, U.S., features artists alphabetically A-J. You will find my work at page 57.